A society with inequalities is and always has been the rational product of Conservative Governments. History shows this to be true. Tory ideology is built upon a very traditional and somewhat feudal vision of a “grand scheme of things”, a “natural order”, which is extremely hierarchical. The New Poor Law of 1834 was based on the “principle of less eligibility,” which stipulated that the condition of the “able-bodied pauper” on relief be less “eligible” – that is, less desirable, less favourable – than the condition of the very poorest independent labourer. “Less-eligibility” meant not only that “the pauper” receive less by way of relief than the labourer did from his wages but also that he receive it in such a way (in the workhouse) that made pauperism (being in absolute poverty) less respectable than work – to stigmatise it. Thus the labourer would be discouraged from lapsing into a state of “dependency” on poor relief and the pauper would be “encouraged” to work. I am sure that the commissioners have descendants that now write for the Daily Mail. The Victorian era has made a deep impact upon Tory thinking, which had always tended towards nostalgia and tradition. Margaret Thatcher said that during the 1800s, “not only did our country become great internationally, also so much advance was made in this country … As our people prospered so they used their independence and initiative to prosper others, not compulsion by the state”. There she makes an inference to the twin peaks of callous laissez-faire and the mythical and largely implied “trickle down” effect. Yet history taught us only too well that both ideas were inextricably linked with an unforgivable and catastrophic increase in destitution, poverty and suffering for so many, for the purpose of extending profit for a few. Writing in the 1840s, Engels observed that Manchester was a source of immense profit for a few capitalists. Yet none of this significantly improved the lives of those who created this wealth. Engels documents the medical and scientific reports that show how human life was stunted and deformed by the repetitive, back breaking work in The Condition Of The Working Class In England. Constantly in his text, we find Engels raging at those responsible for the wretched lives of the workers. He observed the horror of death by starvation, mass alienation, gross exploitation and unbearable, unremitting, grinding poverty. The great Victorian empire was built while the completely unconscientious, harsh and punitive attitude of the Government further impoverished and caused distress to a great many. It was a Government that created poverty and also made it somehow dishonourable to be poor. While Britain became great, much of the population lived in squalid, disease-ridden and overcrowded slums, and endured the most appalling living conditions. Many poor families lived crammed in single-room accommodations without sanitation and proper ventilation. 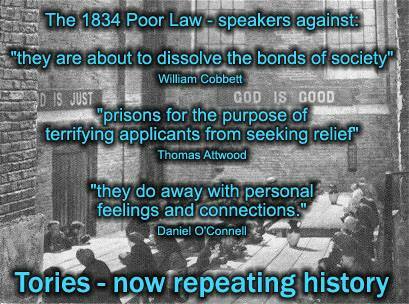 That’s unless they were unlucky enough to become absolutely destitute and face the horrors of the workhouse. It was a country of startling contrasts. New building and affluent development went hand in hand with so many people living in the worst conditions imaginable. Michael Gove has written: “For some of us Victorian costume dramas are not merely agreeable ways to while away Sunday evening but enactments of our inner fantasies … I don’t think there has been a better time in our history” in “Alas, I was born far too late for my inner era”. A better time for what, precisely? Child labour, desperation? Prostitution? Low life expectancy, disease, illiteracy, workhouses? Or was it the deferential protestant work ethic reserved only for the poor, the pre-destiny of the aristocracy, and “the rich man in his castle, the poor man at his gate”? In a speech to the Confederarion of British Industry, (CBI) George Osborne argued that both parties in the Coalition had revitalised themselves by revisiting their 19th-century roots. He should have stayed there. When Liberal Democrat David Laws gave his first speech to the Commons as the secretary to the Treasury, Tory MP Edward Leigh said: “I welcome the return to the Treasury of stern, unbending Gladstonian Liberalism”, and Laws recognised the comparison to the Liberal prime minister, and said: “I hope that this is not only Gladstonian Liberalism, but liberalism tinged with the social liberalism about which my party is so passionate”. The Coalition may certainly be described as “stern and unbending”, if one is feeling mild and generous. I usually prefer to describe them as “retro-authoritarian”. We know that the 19th-century Conservative party would have lost the election had it not been rescued by Benjamin Disraeli, a “one-nation” Tory who won working-class votes only because he recognised the need and demand for essential social reform. Laissez-faire, competitive individualism and social Darwinism gave way to an interventionist, collectivist and more redistributive, egalitarian Keynesian paradigm. There’s something that this Government have completely missed: the welfare state arose precisely because of the social problems and dire living conditions created in the 17th, 18th, 19th and early 20th centuryies The 19th century also saw the beginnings of the Labour Party. By pushing against the oppressions of the Conservative Victorian period, and by demanding reform, they built the welfare state and the public services that the current Government is now so intent on dismantling. The UK Government’s welfare “reform” programme represents the greatest changes to welfare since its inception. These changes will impact on the poorest and the most vulnerable people in our society. It will further alienate already marginalised social groups. In particular, women rely on state support to a greater extent than men and will be disproportionately and adversely affected by benefit cuts. Disabled people even more so. Former Conservative leader Iain Duncan Smith (who didn’t manage to lead his party to an election due to losing a motion of no confidence) is largely responsible for this blitzkreig of apparent moral rigour, a right wing permutation of “social justice” rhetoric and harsh Victorian orthodoxy. Work is being conflated with social justice and social mobility. However, people in work are also queuing at food banks because they can’t meet their basic needs. Reducing welfare simply creates a reserve army of labour that also serves to drive the value of wages down. It creates a downward spiral of living standrads for everyone. The Government asserts that its welfare “reform” strategy is aimed at breaking the cycle of “worklessness” and dependency on the welfare system in the UK’s poorest families. Poor Law rhetoric. There’s no such thing as “worklessness”, it’s simply a blame apportioning word, made up by the Tories to hide the fact that they have destroyed the employment market, as they always do. It’s happened under every Tory government. At least Thatcher’s administration were honest about it. Her government admitted that they were prepared to tolerate high levels of unemployment in order to bring inflation down. 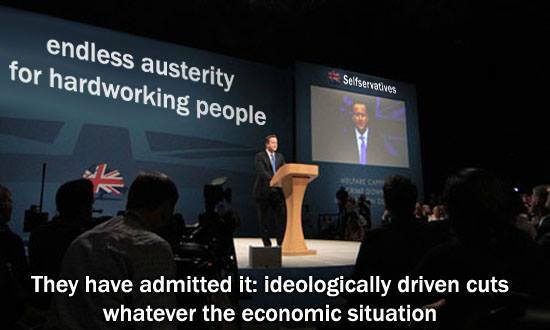 Instead the UK ended up with high unemployment, low wages AND high inflation. The end result was recession. The “reforms” (cuts) consist of 39 individual changes to welfare payments, eligibility, sanctions and timescales for payment and are intended to save the exchequer around £18 billion. How remarkable that the Department for Work and Pensions claim that such cuts to welfare spending will reduce poverty. I have never yet heard of a single case of someone who is poor actually benefitting from someone else reducing an amount from what little money they have. You can’t punish people out of poverty by making them more poor. That idea is simply absurd and cruel. There’s nothing quite so diabolical as the shock of the abysmally expected: the brisk and brazen Tory lie, grotesquely untrue. Such reckless and Orwellian rhetoric permeates Government placations for the “reforms”. The “reforms” were hammered through despite widespread protest, and when the House of Lords said “no“, the Tories deployed a rarely used and ancient parliamentary device, claimed “financial privilege” asserting that only the Commons had the right to make decisions on bills that have large financial implications. Determined to get their own way, despite the fact no-one welcomed their policy, the Tories took the rare jackbooted, authoritarian step to direct peers they have no constitutional right to challenge the Commons’ decisions further. Under these circumstances, what could possibly go right? That marked the start of a very antidemocratic slippery slope. The punitive approach to poverty didn’t work during the last century, it unfortnately simply stripped disadvanted citizens of their dignity and diverted people, for a while, from recognising the real cause of poverty. It isn’t about individual inadequacies: poor people do not cause poverty, but rather, Conservative Governments do via their hierarchical worldview, ideological incentives, policies and economic decision-making. Conservative by name and retrogressive by nature.